Nine-year-old John Joseph Clem hated trains especially their wheels. His mother was killed by a train and the memory haunts him. Today, he is watching the Union trooops assemble and get ready to board a train to head to war....the American Civil War ...the 1860s. John is determined to go to fight. He sneaks away and joins up with the 3rd Ohio Union Regiment having no real idea of what he is heading to. Hunger, exhaustion, fear, cowardice, and desperation become his constant companions. Handed a drum one day, he finds the power of beating out the orders to communicate to soldiers otherwise lost in the fog of war. 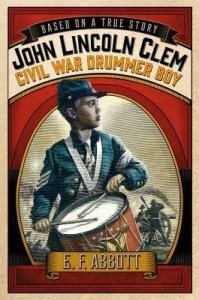 This is an up close and personal story of the reality of war for a young boy and the soldiers around him. Young readers who love getting the facts will appreciate the sense of being there and those who read with a sense of connection to the character will find a friend they want to know more about. Great way to bring history alive for our elementary and middle school readers and made all the more interesting by the fact that this story is based on a real boy who beat the drums on the battlefields of the American Civil War.